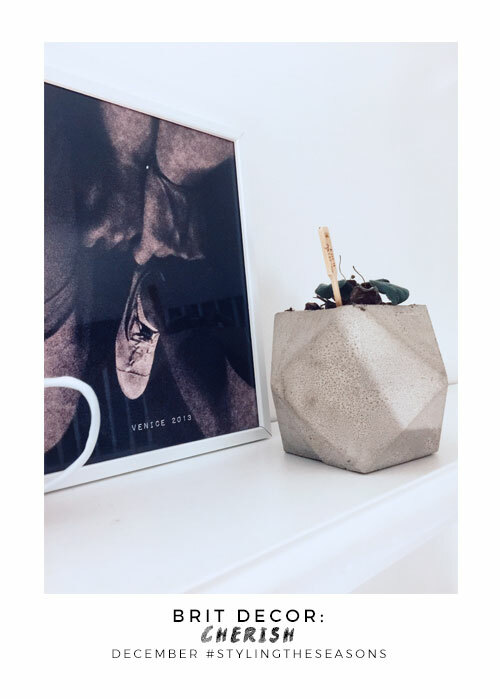 I feel as though I might be arriving a wee bit late to the party, but following a massively inspiring chat with the wonderful Sarah-Lou from interiors and lifestyle blog, Lapin Blu, I recently became acquainted with the blog series, Styling the Seasons. 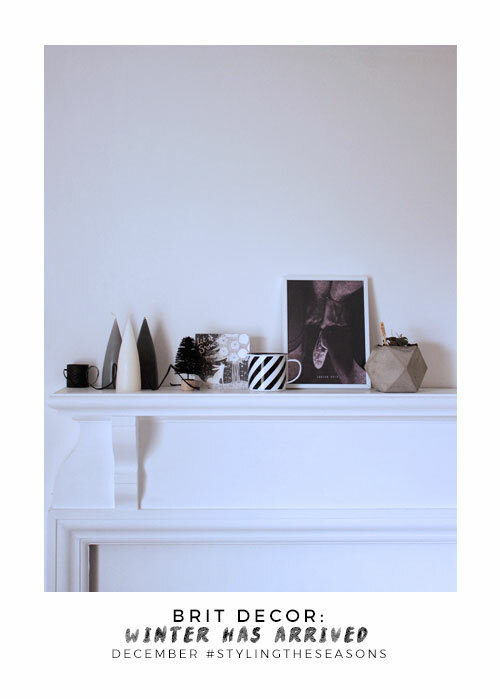 The creative brainchild of Charlotte from Lots and Lots, and Katy from Apartment Apothecary - Styling the Seasons encourages us to ponder over the change of seasons and to create our own translation of these by styling a surface in our homes. I decided to kick-off my personal interpretation of the month of December with a monochrome-inspired collection of 'things' that either represent Winter, or are simply special to me. 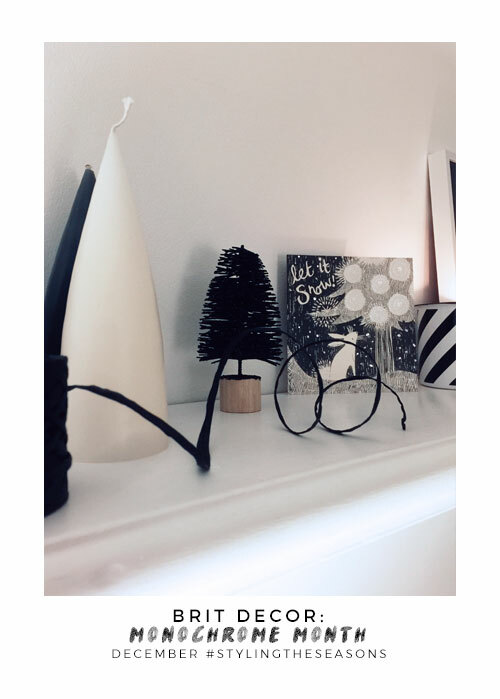 Styled on our white mantelpiece which sits above the wood burner, I wanted to replicate the shape of the cute little black Christmas tree by placing this alongside three cone-shaped candles, as it's so hard not to think of this as the festive season. For me Christmas is also a time of reflection and for looking back over cherished memories - hence my holiday print of Venice and my slightly sad looking African Violet from our trip to Kew. 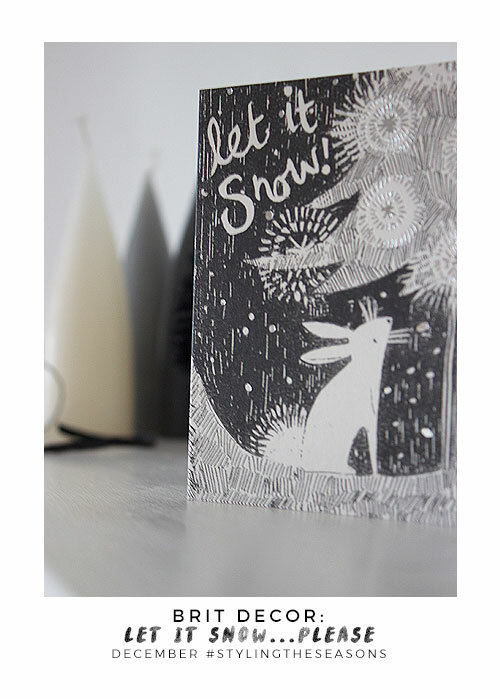 My love of graphics is always evident in our home, whether it's in the form of a photo or a simple monochromatic greetings card like this 'Let it snow' illustration. I put my mono-stripe enamelware mug to good use as a candle-holder during this shoot, and because I frequently associate each season with a particular scent, I opted for a Mulled wine candle here for maximum sensory delight. The heartwarming glow of candlelight and the crackle of a freshly lit fire are key to my perfect December, not least because these are so good at warding of the dark days and nights. Therefore, it seems only fitting that this month should be styled around the mantel - it's definitely THE place to be this month in our home! I hope that you have enjoyed my stylistic interpretation of December. Letterbox Love - My monthly treat from CardNest! 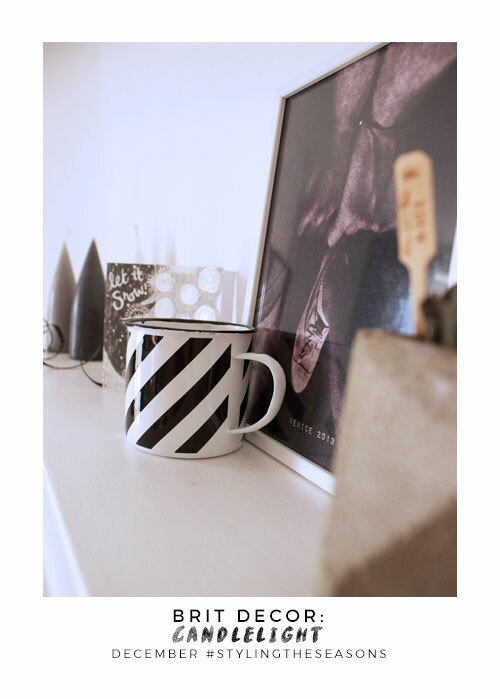 Brit Decor: Put the Quirk in your work!